Opera's latest browser has smashed its download records, with the presence of the much-publicised Opera Unite taking Opera 10.10 to over 12.5 million people in a week. 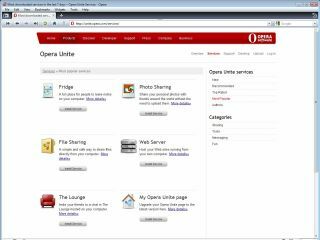 The figure is 25 per cent larger that that released for Opera 10 – which did not include Unite, an innovation that is best described as a 'personal web server'. "With such remarkable download numbers, I am confident that we truly appealed to the needs of the Web-using public, said Opera CEO Jon von Tetzchner. "Opera 10.10 is visually more compelling, and technologically speaking, it goes where no browser has gone before," he adde. "We believe that, over time, Opera Unite has the power to erase preconceptions of how we access and share information on the Web." Opera is hoping that the forthcoming changes in the EU to Microsoft Windows 7 - which will offer a choice of browsers rather than sticking to the default Internet Explorer will give 10.10 another boost. Microsoft recently agreed to make the order of the list of browser random, although most experts agree that the general public will still plump for more familiar names such as Google's Chrome, Apple's Safari, Mozilla's Firefox and the still-dominant Internet Explorer from Microsoft.